Be the first to share your favorite memory, photo or story of Lori . This memorial page is dedicated for family, friends and future generations to celebrate the life of their loved one. Lori A. 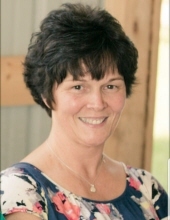 Fox, age 58 of Evansville, WI formerly of Darlington, WI passed away Tuesday, January 29, 2019 at her home in Evansville. She was born December 10, 1960 in Darlington the daughter of Clifford and Gertrude (Leu) Pratt. Lori graduated from Darlington High School in 1979. She was united in marriage to Dennis R. Fox on June 3, 1977 at Holy Rosary Catholic Church in Darlington. Lori grew up in Wiota Township in Lafayette County, WI. Following her marriage to Dennis, they moved to the City of Darlington, South Milwaukee, Stoughton, and later to Evansville in 1987 where they have resided since. Lori worked at Dicks Supermarket in Darlington for a short time before starting an in-home daycare in Stoughton and later working for daycare centers in both Stoughton and Evansville. In early 2000, she began working as a receptionist at Evansville Housing Authority and lastly in Healthcare for SSM Health where she worked until her health would no longer allow it. Lori is survived by her husband Dennie at home; two children: Brian (Christy) Fox of Orfordville, WI and Sara (Josh) Stadt of Evansville; her beloved grandchildren: Kiersten Faldet, Calahan and Cullen Fox, Kylie Hoops, and Kenna Stadt; two brothers: Tim (Vickie) Pratt of Darlington and Tom (Gina) Pratt of Dodgeville, WI; and seven sisters: Doris (Jerry) Quinn of Winnebago, IL, Mary Ann Kowalski and her daughter Susie, Gerri (Larry) Wedig of Darlington, Judy (Jerry) Lindsay, Jill (Kim Gruenberg) Pratt, her twin-sister: Lisa Pratt all of Darlington; and Amy Oppriecht of Eastman, WI; and many nieces, nephews, cousins, and friends. She was preceded in death by her parents; one brother: Roger Dwayne Pratt in infancy; one sister: Linda Larson in 2005; and two brothers-in-law: Wayne Larson and John Kowalski. Lori cherished her family, especially her grandchildren and the time they spent together creating memories they will all remember forever. In her free-time Lori enjoyed crocheting, shopping with her sisters, and traveling with her family. She will be sadly missed and fondly remembered by her family and friends. A Mass of Christian Burial will be held Monday, February 4, 2019 at 11:30 A.M. at Holy Rosary Catholic Church, a branch of Our Lady of Fatima Parish (104 E. Harriet St., Darlington) with Rev. Joji Reddy officiating. Burial will be in Gratiot ME Cemetery. A visitation will be held Sunday, February 3, 2019 from 2:00 P.M. until 4:00 P.M. at Erickson Funeral Home (508 Main St., Darlington) where a rosary will be prayed at 1:45 P.M. A visitation will also be held Monday from 10:30 A.M. until 11:15 A.M. at Holy Rosary Catholic Church. Online condolences may be expressed to the family at www.ericksonfuneralhome.com. For those who prefer, a memorial has been established in Lori’s name. To send flowers or a remembrance gift to the family of Lori A. Fox, please visit our Tribute Store. A visitation will also be held Monday, February 4, 2019 from 10:30 A.M. until 11:15 A.M. at Holy Rosary Catholic Church. Memorials may be made out to "the family of Lori Fox"
"Email Address" would like to share the life celebration of Lori A. Fox. Click on the "link" to go to share a favorite memory or leave a condolence message for the family.